Alan Cotton is first and foremost an artist - one of Britain's most distinguished landscape painters. He has travelled the world to find images that inspire him to paint and back in his Devon studio he starts each new series of canvases for his annual exhibitions at Messum's Fine Art, in London. Alan is also a bit of an adventurer and sets himself challenges when seeking out new ideas. He has always had ambitions to paint at high altitudes. He works entirely with painting knives and mountain landscapes, with their vast structures, facets and transient light, perfectly suit his knife techniques, where he sculpts onto the canvas in rich impasto pigment. Alan has travelled through the Rockies in British Columbia, high into the Atlas Mountains of Morocco and to the edge of volcanoes in the Andes of Chile. His dream to paint in the Himalayas at the base of the world's highest mountain, however, had never been fulfilled - until he received an email in August 2010 from his friend, renowned explorer and adventurer David Hempleman-Adams. The email said: "I have another expedition up my sleeve. I am planning to take a group of climbers and trekkers to Everest, pre-Monsoon from the North Side in April 2011" and invited him to join as exhibition artist all the way to Base Camp. David has made solo expeditions to North and South Poles, flown across the Atlantic in a hot air balloon and climbed the highest peaks of every continent in the world, including the summit of Everest from the south side in Nepal. Alan snapped up David's invitation without hesitation and for the next six months trained with his son Robin, who was to travel with him. They planned to fly out to Kathmandu at the end of April. David and his team of 12 climbers would set off earlier to spend time at the higher altitudes, acclimatising for the ascent of Everest via the North Face. Arriving in Kathmandu, Alan marvelled at the Buddhist temples in Durbar Square. He said: "They are simply magnificent, of an awesome scale, elaborately decorated and intricately carved in gold and ivory." After two days' sightseeing they flew on to Lhasa, the traditional capital of Tibet. Alan had recently read the book Seven Years in Tibet, by Heinrich Harrer, with its magnificent descriptions of 'the golden city'. He was looking forward to seeing the ancient temples and monasteries but sadly many of these have been destroyed and although the Potola Palace, for centuries the residence of the Dalai Lamas, still dominates the skyline, very little of old Lhasa remains. Here was a modern Chinese city, with wide streets and neon lights. They continued high into the Himalayas and after a couple of days arrived in Thingri, just a day away from Rongbuk. Alan and Robin went to bed that night with a heightened sense of excitement - tomorrow they would be at Base Camp. However, their dreams were violently interrupted when nine Chinese police officers - two with weapons - burst into their hotel room. Alan said: "They emptied all our bags and searched every item - even flicking through packets of tissues and examining the hems of garments. They took our cameras and looked at every image. We tried to ask what was happening and what they were looking for, but were told "no questions". Finally they left, telling us not to leave the precincts of the hotel. Needless to say, we didn't get back to sleep that night." They learned a group of American students had staged a protest at the monastery the previous evening, with anti-Chinese banners to mark the 60th anniversary of the Chinese invasion of Tibet. As Alan's party included an American, they were probably suspected of being part of that group. Then Alan received devastating news - because of the protest, the route to Base Camp had been closed and all foreigners were told to leave Tibet. Alan was utterly stunned. The frustration of getting so close, knowing if they had been one day earlier they would have been through the pass, was hard to bear. 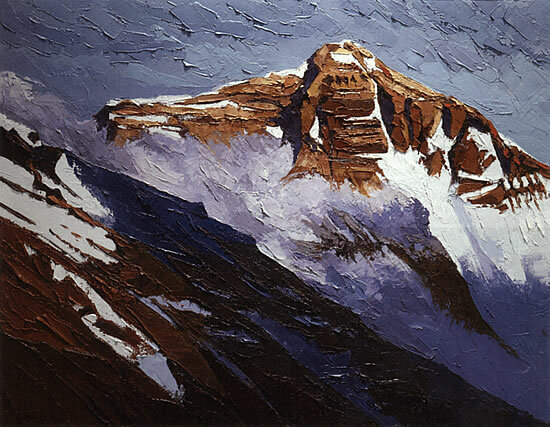 Everyone was desolate at not having reached Base Camp - but for Alan the disappointment of not getting to Everest, when it had long been promoted as the main thrust of his 2012 exhibition in London, left him deeply depressed. Back in Kathmandu Alan and Robin heard David had made his way down to Base Camp to meet them, only to be told that they were now back in Nepal. He had arranged for a trip in a small aircraft for them to see Everest. Alan took his drawing book but sadly, as the pilot was unable to fly over Tibet, they only glimpsed the summit from a distance. They couldn't get close enough or stay around long enough for Alan to draw. Robin took some photos but Alan said: "You need to be in a place, get the feel of it, move around and look at all the angles and viewpoints. A photo doesn't do that". Back at Kathmandu Airport Alan's spirits sank even lower, the reality of the aborted trip having sunk in: "I guess until now I held the faint hope that someone would say 'It's okay, it's been sorted, you can go back'. But now in less than an hour we would be flying back to Heathrow and my dream of painting Everest would be over". When David and three of his team successfully reached the summit, Alan said: "I am absolutely thrilled for them - what a great achievement, but I am just so sad that I'm not out there to celebrate with them". There was light on the horizon, however. In June David phoned to say: "Alan, I know how devastated you were, not to have made it to Base Camp. So I've decided we must go back to Everest - just the two of us - this is unfinished business. Let's go for it!" Alan could hardly believe it, his spirits soared again. They flew out in October - this time there would be no time for sightseeing, their aim being to get to Base Camp as quickly as altitude acclimatisation would allow. 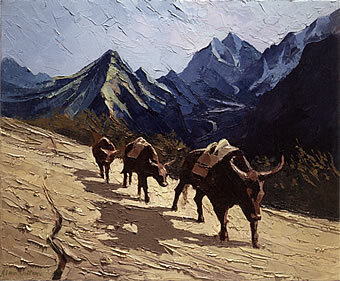 They set off in a four-wheel-drive straight up towards the Tibetan border. 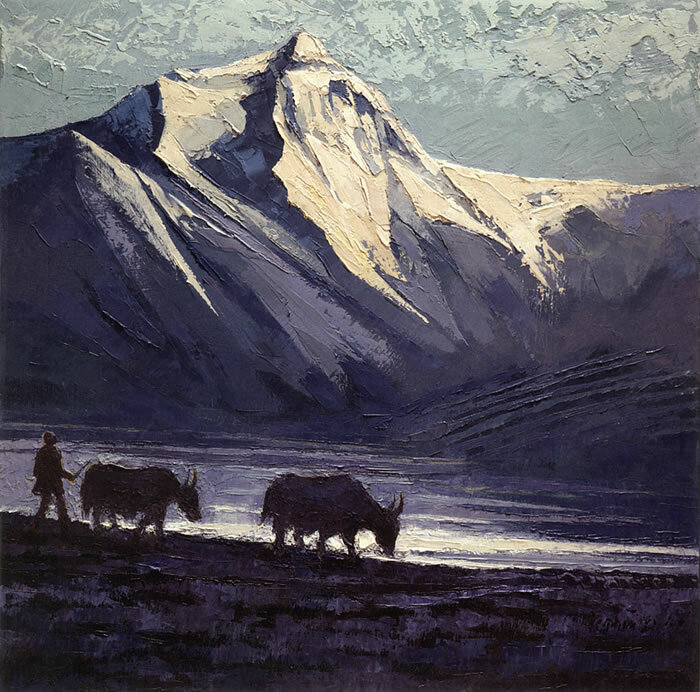 As they climbed higher they saw herds of Yaks, grazing beside the road. At times they were in the clouds and on one such occasion saw a group of these fantastic animals emerging from the mist. Alan did a series of small drawings, before they disappeared into the gloom. They stopped at Nylam, where climbers usually spend four nights to rest and acclimatise to the altitude, but after two nights Alan persuaded David to move on. The experienced climber was very focussed on the importance of acclimatisation and the dangers of altitude sickness and kept a very careful eye on his enthusiastic friend as they continued up towards Everest. They arrived at Old Thingri and were at about the same altitude as Alan and Robin reached when they were turned back by the Chinese Police. There are two routes to Rongbuk but, impatient to get there quickly, they decided to take the shorter, but more difficult one. It took them through rough terrain, strewn with boulders and across frozen streams and rickety wooden bridges. 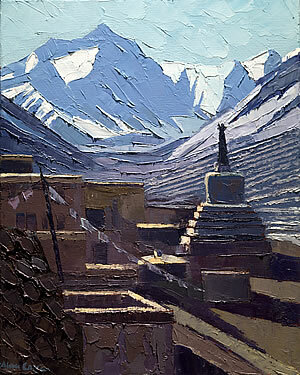 By late afternoon they had reached Rongbuk Monastery, the highest ecclesiastical building in the world. 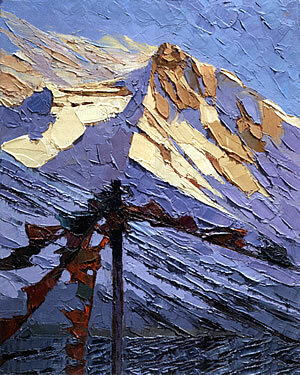 Alan could see Everest clearly and sat beside a spire-topped Chorten, looking towards the summit bathed in evening sunlight. Chortens are stone mounds that originally housed the relics of the Buddha. Now they hold offerings and prayers and are believed to have a positive effect on all who pass by. David decided that as there was no expedition based up there and no facilities or supplies, they would travel up and back down each day, sleeping at Rongbuk. They left at first light, going quite slowly and resting frequently, as breathing at that altitude is more difficult. At last they were at Everest Base Camp. Alan wrote in his diary: "I don't have enough superlatives to recreate on the page the emotions and exhilaration I felt at being so close to the highest mountain in the world. The only sad note is that my son Robin couldn't be with us". Alan drew quickly to capture every detail of the mountain. It is such a well-known image he knew he had to get the topography right. Although the summit was still in sunlight, they were now in deep shadow, with temperatures dropping rapidly. Even with silk gloves under his woollen ones, his fingers were numb as he sketched feverishly, before the sun finally disappeared. He was fascinated by the prayer flags - panels of cloth containing texts and prayers, which the Tibetans believe will be blown by the wind towards Mount Qomolangma - the ancient Tibetan name for Everest. The sun was low on the horizon and the glistening slopes were bathed in golden light, with the ridges casting deep blue shadows into the valleys. Chilled to the bone, Alan was finally persuaded by David that it was time to start back. 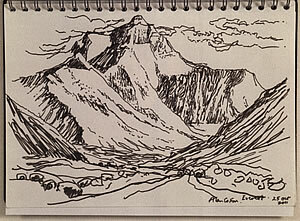 He packed away his drawing book, filled with the images that would form the basis of paintings, back in Devon. All too soon their time living at the base of Qomolangma came to an end. Now they must make the 12-hour, hair-raising journey back down to Nepal. Alan recorded: "This has been the toughest adventure I've had in my life - but by far the most awe-inspiring. Because of the altitude, temperatures and rugged terrain I was often out of my comfort zone. Drawing at those temperatures was often painful, but the sheer exhilaration and the images I saw will, I know, find their way into my paintings. When I have a new experience, wherever I travel, that is when my best work comes. I can't wait to begin the paintings. I will start with a large one of Everest as a thank you gift for David Hempleman-Adams, for without him organising both trips and returning with me, I would never have done it". Alan Cotton has already completed over 20 Everest paintings, so to 'see the magnificent results of that awe-inspiring journey - without numb fingers - visit his London Exhibition, which opens at Messum's Fine Art in Cork St on 12 September 2012. "Art On Top of the World"